The idea that everyone goes to Heaven is negated in the Bible. As MRM’s web article on Heaven and Hell explains, “The Bible teaches that there is only one of two possible destinations awaiting mankind after death: eternal punishment or eternal life. To those who have been justified by faith and received the righteousness of Christ applied to their account, there awaits a glorious eternity in heaven. To the rest who willfully reject God’s gift of salvation or who attempt to appease God’s demand for perfection by some other way than trusting in the righteousness of Christ, there awaits the terrors of hell” (see also “Will God Save Everyone?”). Though they may not know the specifics of biblical soteriology, most people understand that the Bible says some will go to Heaven and some will go to Hell. When the Mormon Church tells everyone that they will go to Heaven, it implies that there is no Hell to fear. Thus the Church plays the role that the Book of Mormon ascribes to the devil (see 2 Nephi 28:22). Furthermore, in addition to being dangerous to the souls of men and women, the Church’s blanket promise is misleading at best. On the Church’s own websites it consistently defines “Heaven” as having two meanings: The expanse around the earth; and “the place where God lives and the future home of the Saints” (or “the faithful”; see here, here and here). “Heaven” in the context of the afterlife, has definite boundaries imposed by the Mormon definition. It is “the place where God lives” and the place where “the Saints” or “the faithful” will live in the future. The definition does not lend itself to the inclusion of the unfaithful or the Mormon concept of the lower “kingdoms of glory” where God the Father does not live — or even visit. While the Mormon Plan of Salvation might soothe itching ears (1 Timothy 4:3-4), it will not help anyone escape the wrath to come (1 Thessalonians 1:10). Everyone will not go to Heaven. But Jesus is calling you to be reconciled to God through Him – to “have peace with God through our Lord Jesus Christ” and to be “saved by him from the wrath of God” (Romans 5). Will you respond to His call? This entry was posted in Afterlife, Salvation and tagged Degrees of glory, Heaven, Judgment, Mormon Salvation. Bookmark the permalink. I learned a few years ago that everything that is discussed with a Mormon must draw a sharp distinction between what Mormonism teaches and what orthodox Christianity teaches. The reason for this is that Mormons/LDS church has tried to make their sects’ doctrines sound amazing just like orthodox Christianity. I would have thought that these Mormon boosters would want to draw those sharp distinctions themselves. That’s what early Mormon leaders did; especially when they went full throttle into their creative mode. Salvation in the Mormon system doesn’t resemble anything taught in the Bible or practiced in the early church. The claim that Mormonism is a “restoration” of first century Christianity can’t hold up to scrutiny. To-that-end, Mormonism depends on pat slogans, mis-information, obfuscation and I’d say flat out lies, in order to gain converts. The bottom line is that we can do nothing to earn our salvation. Their is a huge performance gap between what we are and the perfection that God demands. The only way to close that gap is through faith in Christ. men would introduce after his mission was over —Gal 1:8; 2 Tim 4:3-4 .
it by climbing the long gospel ladder up to heaven which Mormon leaders have constructed. Faith in Jesus is merely the first rung on this ladder . author to pardon and give what is offered —eternal life : Rom 3:23; 5:8,10 ; 6 :23 ; 10:9-13 .
able to save completely anyone today , and those Mormons have exchanged their ” restored ” gospel for it , and become free from a man made religious system . I have to agree with Sharon that this little article is misleading about LDS theology. As you have stated above heaven (from an LDS point of view) is living fully in God’s presence, i.e. the entire Godhead. 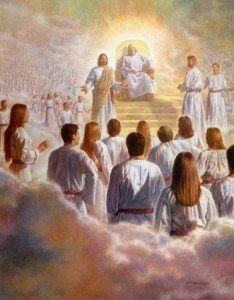 Everyone will resurected and everyone will end up in God’s Kingdom, but not everyone will make it into heaven. I can only assume the reason this little blurb is so unclear is because of the brevity of the overview, however they really needed to ad an additional section detailing the three degrees of glory in order for this to make more sense, otherwise it does come off as confusing to say the least. I would agree with you regarding the LDS site, perhaps, but the history and tradition of the LDS church is to hide what it believes. The LDS church projects, to the world, a picture that would show it to be just like Biblical Christianity. However we know, for example, that the LDS “god” is not the “God” revealed in the Bible and who is worshiped by orthodox Christians. The LDS Jesus is not the Jesus revealed in the Bible. In fact the “god” of the LDS sect bears no resemblance to the God of the Bible and who has been recognized by Jews and Christians for 4,000 years. Finally, what is recognized as “salvation” in the Christian tradition, as reflected in the Bible, is not what is taught by the LDS SLC sect. The point of the LDS system is that those men who are successful in the “system” will become gods, rule their own planetary systems and procreate spirit beings with their goddess wives. I point this out to Christians all the time and it’s always a jaw dropping response I get. The LDS church is not real open about this and to my knowledge it’s not part of the lessons presented to prospects by LDS missionaries. So do Mormons understand that the “god” they acknowledge as God and the LDS path of salvation is a contrivance of men and doesn’t reflect the Biblical reality? This is serious business. The Bible clearly teaches that there is but One God, that we are separated from Him by our sin, and that the only pathway to salvation, being with Him for eternity, comes through faith in Jesus. There’s nothing that can be added to this. The life we lead after coming to Jesus in faith has nothing to do with our salvation as far as earning it. They would reply, “I KNOW…………………” and away we’d go with the testimony and the burning in the bosom. So where are we if I give an “I KNOW….” in return and also claim a burning in the bosom? Where do we go from there? We both KNOW. We both claim a confirming feeling. So who wins? In baseball a “tie goes to the runner”. In all sports we have some sort of rule that provides guidelines for the official to interpret the rules. So when a person with a particular religious conviction, especially those based on some sort of expounding prophet, makes a claim to truth, is there anyway to determine (the truth)? I could give a Mormon countless examples of why Joseph Smith and those who followed him as the Mormon living prophet aren’t prophets. The problem is that when someone claims “to know” something and they have a confirming feeling, they aren’t going to easily deny their feelings and the convictions those feelings support. In the case of Mormonism, when an LDS member avails themselves of pertinent and readily available information about their source of truth, the living prophet, they have to work-up a whole lot of feelings, I knows, and “all better now” religious blankies to continue to believe in these false prophets. It’s quite simple. The Bible tells us that Jesus is the Way, the Truth and the Life and that no one gets to the Father except through Him. This is done by faith and not our own efforts which we are told amount to nothing but dirty rags. Salvation through Jesus Christ and our eternal reward is something we don’t deserve and we certainly can’t earn it through false religious observances classified as “works”. Any works we do, as believers in Jesus, are to glorify Him, not ourselves. I would say that the Bible provides the best guide to determine the truth regardless of our feelings. by the imitation gospels that well dressed , polite , individuals can bring to doorsteps . So if it’s not the “burning in the bosom”, how is someone to know if something is true or not? I must admit, the “burning in the bosom” is quite impressive as far as it goes. By that I mean that a person has received an emotional and physical reaction to some form of stimulus. In the case of Mormons, they believe that this is how they know something is true. God, it is assumed, has spoken to them a confirming message. It’s the way they think that God is communicating to them. It’s a pretty big deal, if you believe it. So there we are right from the get-go. Does God communicate truth to us by emotional and physical responses to ideas? Frankly, I wouldn’t assume that. If you visit Mormon historical sites, one of the things the tour guides try to do is provide those on the tour with some sort of emotional buzz. The participants then think they’ve had a spiritual experience which serves to reinforce what is being presented. So in the above article, if the idea of hell makes someone feel negative feelings, than “hell” can’t be a real place, right? I wonder if Mormons, who are given to feelings as a test of truth, would ever consider that a negative feeling response to the idea of “hell” might be a way of pushing a person closer to finding a solution to their lost spiritual condition? Ah, the ol’ burning in the bosom, or in other words, Mormonism’s end-all, be-all way of knowing truth. Does God use inner feelings of knowing to transmit his will or truth? Sure, I believe he does. Is that form of knowing the superior form of knowing? I don’t believe so. Indeed, as one way of knowing, albeit a very unreliable way because the human heart is so fickle, it can only be taken into account as one uses other methods of knowing spiritual things–circumstances, wise spiritual counsel, the Word of God, reason, study. Of course the LDS acknowledge these as ways of knowing, too, but that burning in the bosom trumps all others. Having said that, I’m reminded of something that happened in the old Language Training Mission in Provo during my stay there. During sacrament meeting one Sunday, we were told that families could no longer see their missionaries off at the airport, effective immediately. There were always missionaries flying out on Monday morning. These missionaries were told they would be allowed to call their families to cancel their plans. There was a flurry of discussion, and some very heated ‘opinions’ were expressed. Then one elder got up and, in a quavering voice, assured us all that he had just prayed about it (he was one flying out the next day), and the Spirit confirmed to him in a most powerful way that this was the Lord’s will and we all should accept it humbly. As the discussion progressed, the dude conducting the meeting explained that the announcement from the first presidency was not real. He turned the discussion toward our need to look at our hearts to see how obedient we were even under challenging circumstances; if we were disturbed by that announcement and felt anger and sadness, we had need to repent and to really examine our willingness to serve the Lord. To this day I wonder how that elder who had the confirmation of the Spirit felt–like a fool? a child? Once I was ‘in country’ on my mission, I found out that little exercise had been going on for years. Also, there usually was someone who experienced that burning in the bosom concerning the matter. It was a mean, low trick and a very manipulative object lesson. And it did get me to thinking, “Indeed, how does one discern truth using the burning of the bosom?” That line of thinking eventually showed me the door out of the LDS church. Excellent post. Some years ago we had a former Mormon posting here, I believe he went by the handle “fmelo”. Anyway, he and I had lengthy e mail discussions regarding this “leading by the Spirit” etc because it was one thing that came into question as he found himself (questioning) Mormonism. It’s a religious culture thing that’s a hold over from the early days of Mormonism, I believe. J. Smith was very aware of the Methodists revivals of his day (probably attended them) and this sort of emotional lingo was part of the package. It goes on in Christian churches also. I’ve sort of moved out of that part of the Christian experience, to some degree. It just gets over-used and I believe cheapened. BTW, Smith’s going off to the woods and seeking God was a fairly common practice of the time. See Charles Finney’s testimony. Here’s part of it but he went into the woods also. So how does someone know spiritual truth except by spiritual means? Mormons like to use the example of the apostle Peter confessing to Jesus that He (Jesus) is the Christ. Jesus tells Peter that the Father has revealed this to him. Mormons get all excited about this, extrapolating/applying Peter’s experience of “knowing” with their “knowing” that Joseph Smith is a prophet, the BoM is the real deal, that the LDS church is the “true” church and that the current LDS prophet is God’s mouth piece on earth. Mormons are masters of mis-applying Scripture to fit their own particular needs. In the case of the Mormon’s “knowing”, they are assuming that they are “knowing” by the same means that Peter “knew” that Jesus is the Christ. It’s all very spiritual sounding this Mormon testimony based on direct revelation from God. Why would anyone doubt such a testimony especially if it’s delivered with all knowing confidence? That’s what Mormons are counting on, the persuasiveness of their testimony to make the sale. It’s a real badge of honor in the LDS church to have a “strong” testimony. When faced with information and evidence that contradicts their testimony a favorite LDS line is, “I knew all of that a long time ago and it doesn’t effect my testimony one bit.” What to say to all of these former Mormons who no longer have this testimony? Well they never had a strong testimony, someone offended them or they just want to sin. In fact, it is claimed by the faithful LDS member, that within a year of leaving the LDS church the apostate will be in serious sin like drug and alcohol abuse and sexual deviant behavior. It can never be that the person figured out that the LDS church is not the true church and that Smith and his BoM are totally bogus and that the current prophet isn’t as he is billed to be. It must be remembered that after His resurrection, Jesus continually pointed His disciples to the Scriptures where the truth about Him could be found. I’d suggest that be the place a Mormon start on their quest to find the truth. In the Word of God, the Bible. How tough is it to give up Mormonism? For some Mormons, probably not tough at all. The religion never “took”. It’s been theorized that there are just so many people, a sub-set, who’d be interested in a religion like Mormonism. Let’s face it, how many people would be into the temple program? That’s something to remember. Not all those on the rolls of the LDS church, who would be considered “active”, do the temple program. If a husband isn’t interested in it, the wife is left out in the cold. Is Christianity “easier”? Look at the list above in the article regarding LDS salvation. When the truth is known, there’s a lot of religious hoops to jump through in Mormonism. That’s why some Mormons dig the program. They like doing and the idea of earning ones spot in the Celestial Kingdom makes sense to them. So is Christianity “easier” in regards to being counted in the Lamb’s Book of Life? Mormons make the mistake thinking that Christians believe that all that is required is to believe and then party down. In-other-words, behavior is not a component in the formula for being saved. Let me say this. Faith is putting our trust in the Lord Jesus Christ and His finished work on the cross. We can’t add anything to what Jesus has done for us. However the emphasis in the Christian walk is our personal relationship with God through His Son Jesus Christ. What does that entail exactly. The writers of the NT address that topic repeatedly. In summary, we walk in a manner that Jesus walked and we have fellowship with God and with each other. It’s not a lot of religious “doing”. It’s drawing near to God and being transformed, sanctified, by the Holy Spirit. This is not religion. God/ Jesus to restore the gospel , that salvation is only found in submitting to his teachings. accept that their gospel preaching is accurate , that it is indeed the true gospel of Jesus Christ. the true gospel of Jesus , rather they teach ” the precepts of men ” on some important issues . also can’t be trusted to consistently provide sound doctrine — 2 Tim 4:3-4 ; 2Jn 7-9 .
fooled by counterfeits appearing in the latter days . The one really big issue for Mormons in regards to salvation is “authority”. In-other-words, their “one true church” alone has the authority to baptize folks so that they may receive salvation. This comes through the Mormon priesthood which Mormons believe has been restored through Joseph Smith. This is a very big deal to Mormons; the authority to baptize. It sort of blows their claim for the need of authority to baptize when it is pointed out that being baptized is not necessary for eternal life. In the Book of Acts, I think it’s in the 16th chapter, the Philippian Jailer asks the apostle Paul, “Sirs what must I do to be saved.” Paul’s reply is, “Believe in the Lord Jesus Christ and you shall be saved. You and your household.” The point is that the requirement is “faith”. Now the Jailer and his family were baptized but it was their “faith” that resulted in their salvation. So Mormons have zero authority except within the context of their own religious system. It’s a false claim in terms of God’s plan of salvation. When we believe in the qualified Savior, Jesus the Christ, and accept His sacrifice as total payment for our sins, eternal life is secured.